You’ve spent the last hour inspo-browsing through your favourite recipe website. It’s your turn to make dinner tomorrow night and with a few clicks you’ve got all the ingredients you need en route to your doorstep…including that toilet paper you’ve been meaning to pick up. Easy, peasy. A food website that takes classic editorial recipe content and makes it actionable through e-commerce. 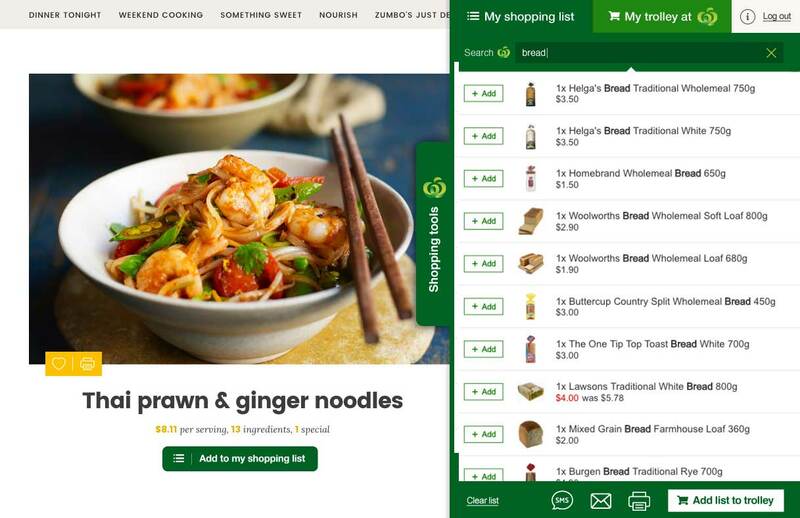 Users can find delicious recipes and order the ingredients, as well as all their other Woolworth’s shopping, directly online through the website. No one was using the shopping tool. The brand had built up great user engagement, but despite good traffic the e-commerce function of the website was not being used. The Shopping Tool (ST) was an external add-on product from a UK company and this was its first run in Australia. The contracted company was very resistant to making changes to the ST because they were not able to make customisations specific to individual instances of the tool, which meant any agreed upon changes would need to be rolled out across all sites that were using the tool. We were also not privy to data collected once users were engaged with the ST as it was considered a separate entity from the website. Why were users not engaging with the Shopping Tool? The problem was clear, but the why’s behind it were not. There were many variables to take into consideration and we had a lot of questions. How did users currently use the site? Was it clearly communicated that you could ‘shop a recipe’? Was it clear how to ‘shop a recipe’? What followed was a deep dive into the who, what, and where’s of the product. We chose the UX methodologies that were most relevant to our problem at hand to help guide our analysis. What is Australia’s online grocery market? Australia is often a unique market space. It’s not uncommon for international brands to have trouble gaining traction here. The common mistake is assuming that what’s worked overseas will work here and this proved true in the case of online grocery shopping. How do other grocery shopping tools work? We did a thorough analysis of every major recipe grocery shopping tool experience and compared them feature by feature to our ST experience. Why are users not engaging with the shopping tool? Without access to the ST data, we were blind. We wanted to see firsthand how people were using the site and how they would ‘shop a recipe’. The test involved an in-person pre-questionnaire, a scripted live testing of specific tasks on multiple devices, and a followup online survey. “I don’t know what the difference between the shopping list and trolley is…I’m already shopping online. 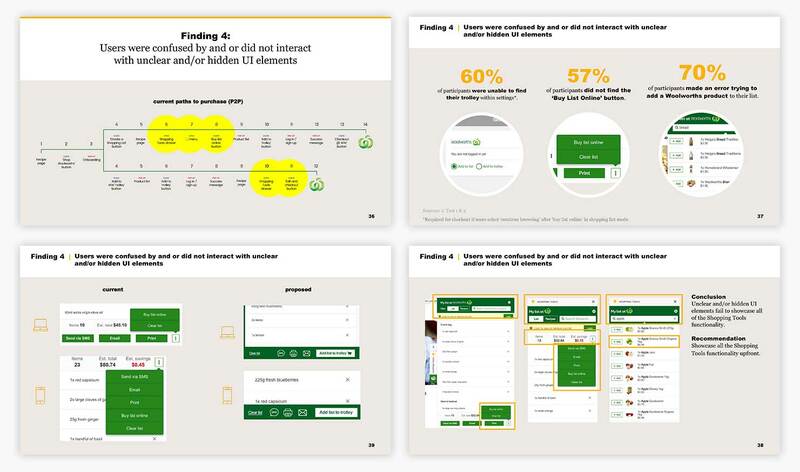 We mapped out every user journey that currently revolved around the ST and then we combined our insights from the user testing and the comparative market analysis to propose a new and improved map of ST user journeys. 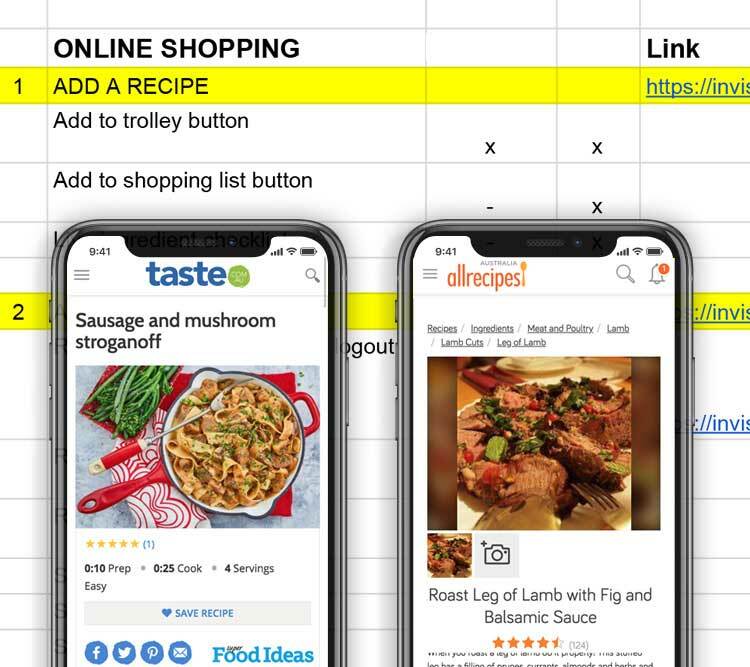 We mapped out the current task of ‘shopping one recipe’ and then we combined our insights from the user testing and the comparative market analysis to create an updated task flow that would reflect the changes proposed in the new user journeys. The user testing answered a lot of our questions, while also bringing to light some things we were not aware of at the start (i.e. the majority of testers who were already online grocery shoppers treated it as a once-a-month tool to get their essentials). The result was four clear findings. They overlooked the button to open the ST in most instances, mistaking it for an advertisement. It was hidden in the ST on a separate tab and difficult to access. There were multiple menus that weren’t clearly labelled and the menu items were not structured or organised in familiar ways, which made it difficult for users to navigate based on assumption and their previous internet browsing experience. Users felt that the constant sign up popups blocked them from continuing to explore the ST. Some cited that it felt like too much of a commitment, too early in the exploratory phase, when they were still trying to assess the product and its value to them. Redesign and rewrite the ST’s calls to action so that their message, purpose and function is clear (i.e. actionable, not an advertisement) and A/B test different versions to maximise efficiency. Reconsider strategy and placement of onboarding experience. Redesign and rewrite messaging and streamline the flow. Showcase all the ST’s functionality upfront by removing unnecessary menus and grouping like items together. Request commitment from users only when absolutely necessary during the path to purchase. The complexity of the product was mirrored by the complexity of the teams surrounding it. The solutions had to consider multiple stakeholders: those within the company and those outside of the company who created the original Shopping Tool product. Solutions had to be easy to implement, low cost, to the point – and approved by both sides. By removing unnecessary steps from the process and aligning it more closely with user expectations of how a shopping experience should work, we were able to simplify the most important task flow ‘Shop one recipe’ and the user journeys. Quick and dirty wireframe sketches were made to get approval from internal stakeholders on our proposed changes. After approval we made rough visual mocks to present to the ST company to provide a quick and easy explanation of the changes. Compiled, designed, presented and revised multiple presentation decks that would best showcase our research, findings and the importance of our proposed changes.